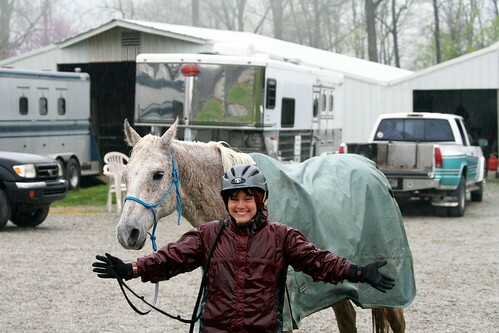 One of my favorite times: Time to go to the Chicken Chase Endurance Ride! This would be our 7th year to attend this 3-day ride near Henryville, IN, the birthplace of Colonel Sanders. 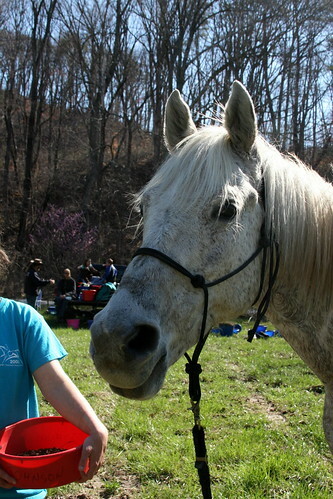 This year, Serts joined us for the trip as I had hopes of riding him in his first 25 mile ride. Tanna was entered in the 55 mile ride on Friday. Wednesday morning, we finished the packing, loaded up the horses and headed north. After 4.5 hours (including 30 minutes worth of stops), we arrived at Bill Wilson's farm on the edge of Clark State Forest. We parked in our usual spot along the fence-line. This was our first time to bring Serts to this ride and Daniel and I discussed at length how to arrange the panels to get the best layout for the horses. We finally settled on a layout that worked for us at Yellowhammer and Daniel proceeded to assemble the pen. The weather was uncomfortably cool (low 40s), so Daniel and I brought Sib, our cat, into the slide-in camper with us for the evening. 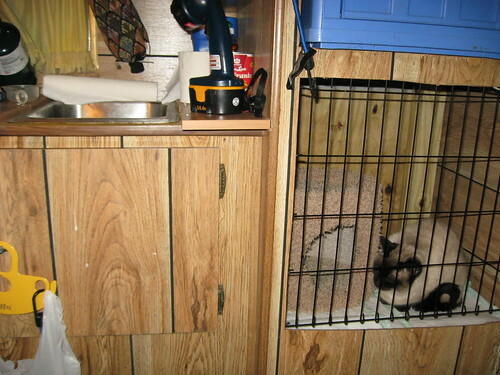 We fashioned a crate out of a cabinet and the divider from her wire crate. It worked quite well and at least kept her out of the trailer for the night. The next day, Daniel and I enjoyed a leisurely morning with pancakes and oatmeal for breakfast. Then I saddled up Serts and went for a ride. Serts wasn't due to have his ride until Sunday and I wanted to give him a little exercise and allow him to see the trails. I headed out along the ridge for a couple miles and then allowed him a canter (he loves to canter) along the way back towards camp. I passed camp and headed to ride the last 1/2 mile of the trail that Serts would be doing so he could see where he was. His HR was good and I kept it largely to under 135 for the ride. 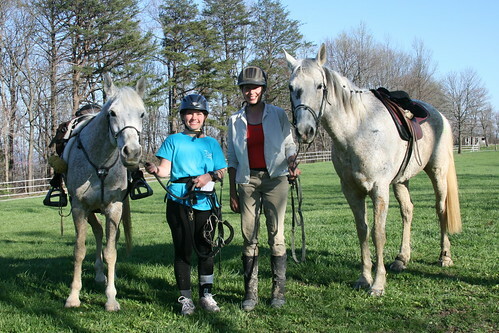 As I approached the entrance to the trail, I came on Amy Whelan and her daughter Annie out for a ride. 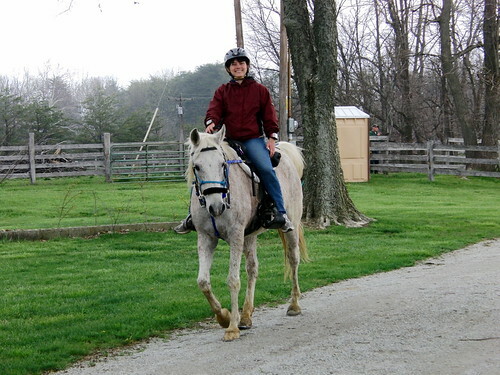 Annie is in training for her first Competitive Trail ride and later this year, hopefully, an LD ride! As they were headed back to camp, I invited them to come along with me for the little jaunt along the trail. They accepted and I had a wonderful time chatting with Amy and Annie. The weather was warming up somewhat, although it was still cloudy and a little cool. After returning to camp, I settled Serts in his pen next to Tanna (who had not stopped moving the entire hour we were gone, I was told). I put my ankle brace on and headed out for a run. I so enjoyed being back out running on the trails. I had run some on my treadmill at home, but I truly love the trails, especially the day before an endurance ride. Something so soothing about being out on my own two feet in God's nature. It also teaches me to appreciate my horses more as I run the trails they traverse! Then it was time to head to registration. I hung out with Amy and Susan Vuturo as they checked people in. I also bought a year's worth of Girl Scout cookies. :) It's another tradition to buy them from Amy and take them home and put them in my freezer. Periodically through the year, I'll pull a box out and we'll enjoy some cookies. I finally decided it was time to get Tanna and take him to the pre-ride vet check. But Tanna had other ideas. I made it back to our trailer in time to see Tanna lowering himself to the ground with a sigh for a sunning and a rest. Serts quickly followed suit. Well, well. I didn't want to disturb them (aren't they spoiled??) so I headed back to hang out at the registration desk for another 30 minutes or so. While watching people register for the next day, I was introduced to Sabine. This lovely lady was planning to do her first 50 mile ride the next day. She had many limited distance (25 - 35 mile) rides, but this would be her first longer ride. I was happy to tell her she could ride with me if she would like to as her friends had decided to ride the 25 mile ride the next day. 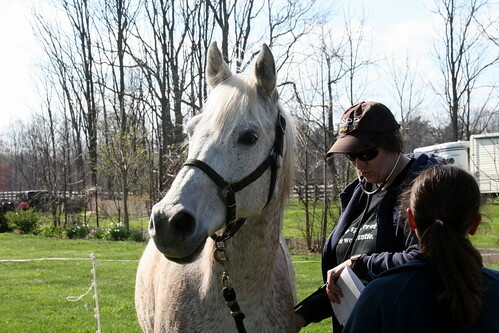 When I returned, Tanna was standing, so I haltered him and we went to the vet for a look-over. 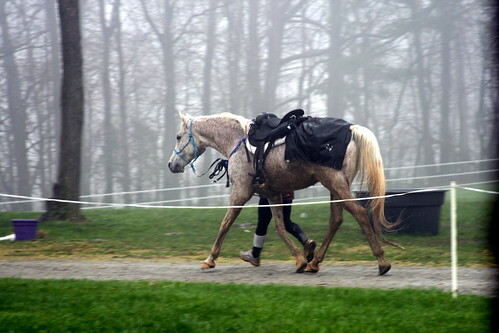 Tanna bounced through his trot-out with his usual enthusiasm and we were cleared to ride the 55 mile endurance ride the next day. I spent the next hour or so getting my vet check bag ready for the away vet checks the next day. We would ride a 20 mile loop to the vet check, then do a 20 mile loop back to the same vet check before heading the last 15 miles for camp and the finish. So I needed to pack enough stuff for 2 vet checks. Bottled water, bags of feed, granola bars, feed pan, hay, apples, carrots, hoof pick, fly spray, Forerunner 305 travel charger, wool blanket to use as a cooler, syringe, Lyte Now, jars of probiotic/applesauce mixture, hand-held heart rate monitor. Check, check, check, check. Finally the bag was ready. Back to the garage for the ride meeting to go over all the things we needed to know for the next day. The horses must meet a 60 bpm pulse before the hold time started. Hold times would be 40 minutes long after pulsing down. Tack on or off, rider's choice (I tend to prefer tack off). Friday morning, Daniel and I saddled up in the chill and I headed to the start to warm Tanna up. 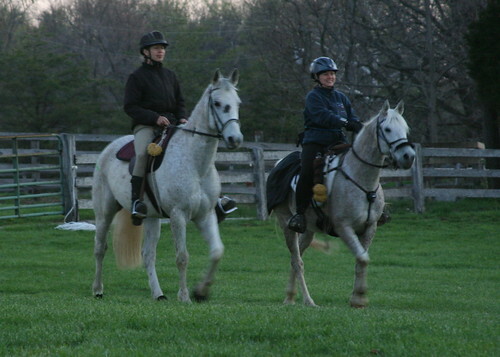 I saw Sabine and Leon, her horse, warming up as well and we continued to warm up together while chatting merrily. When the ride started, we walked calmly down the road to the trail. The horses seemed to get along ok and were walking beautifully. We began trotting after reaching the trail. I kept Tanna to a moderate trot. He prefers to go all out, but I don't. :-) Before the first turn, we were overtaken by a group and we allowed them to pass. Over the hills and through the woods we went, Sabine and I chatting. I kept Tanna down to a dull roar, determined to keep the pace slow and controlled. We reached the first vet check in decent time. 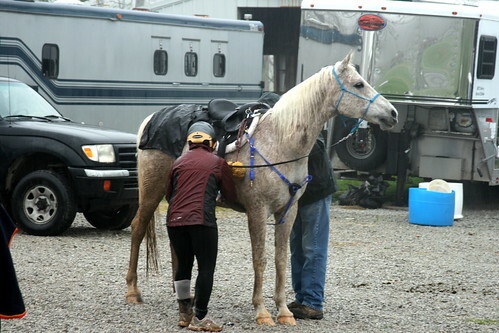 I located my vet check stuff brought out by the ride management and pulled Tanna's saddle off. My hand held HRM didn't want to tell me his HR, so I just took him straight to the vet in. He was down and vetted in ok, although his muscle tone was down a bit. Back to our stuff for the rest of the hold. I plugged my Forerunner 305 into the travel charger and fed Tanna. I stood holding his feed pan so he would eat. He ate pretty well (for him) for the first vet check. Before long, it was time to head back on trail. This next loop would be tough and slow going with lots of hills and switchbacks. We met several riders as part of the loop was an out and back. We saw a few riders that had missed some trail and had to be sent back out to complete the trail. They still passed us. ;) We took over 4 hours to do that 20 mile loop. It was long and warm and a very tough loop. Back into the vet check again. Tanna was doing ok, but not as well as I like to see. I began to think I had neglected his conditioning somewhat while getting Serts ready. Still nothing really said don't keep going, so after the hold we saddled up again and headed out. I packed all my things together for the return trip in Amy's truck and Sabine and I headed back to camp for the last 15 miles of the journey. Sabine's horse, Leon, has a very nice long trot that he can do pretty effortlessly. Tanna, on the other hand, was fighting to keep up at a trot and I didn't want him to canter overly much as I was worried about his muscle tone. So it was a struggle for the last loop until Tanna and I took the lead. Leon seemed to do well at shortening his stride to stay behind us. I encouraged Sabine to head out on her own if she wanted, but she stayed with us. I enjoyed her company and we had a good time chatting all day long. Finally, we made it to the top of the last hill and came out on a gravel road on the ridge. Only 2 miles to camp! Whoohooo! I still insisted on a slow trot. I didn't want the horses to blow themselves out and have a hard time pulsing down at the finish. Tanna danced and snorted and blew, but stayed at an 8 mph trot. I laughed as Leon spooked at something and told Sabine she should be happy he had the energy left for such antics. Tanna's energy was not in doubt as he pranced like an idiot. 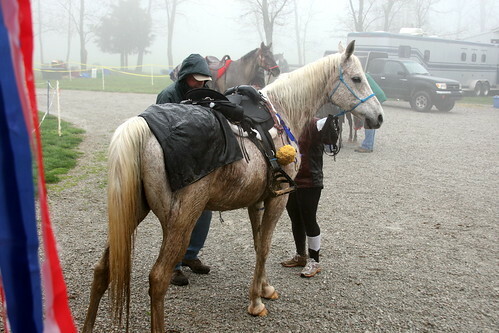 I got my finish time and headed back to the trailer to pull Tanna's tack. (Serts was quite enthusiastic to see us!) I found his hamstrings pretty tight, especially his left one that seemed to be knotted some. I massaged it for a few minutes before heading up to pulse and vet in. Tanna's back was sore at the loins, also the left. I was not too happy about that. I could be riding off due to my leg injury. Or the saddle might need to be tweaked some. I took Tanna into the pulse box and got his finish pulse. Sabine and Leon were at the other end of the box, so I kept Tanna nearby so as not to undully excite him. I continued to massage Tanna's hamstring to keep him from knotting up. We'd done the miles and I wanted that completion! 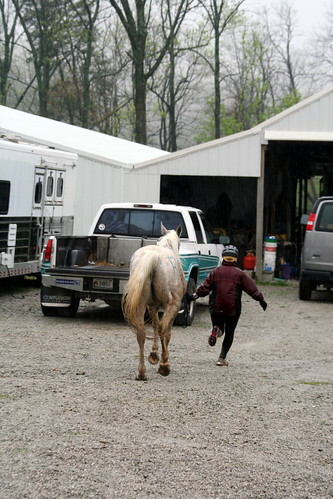 When I got Tanna back to the trailer, I found a large rock wedged in his front left hoof. Hmmm, wonder if that had anything to do with it? I walked Tanna and gave him periodic massages until the ride meeting/awards, keeping him covered with his cooler to keep him from getting chilled. The weather was warm, but it was late in the day, cooling off and a breeze was prone to come up. After a nice shower, awards and dinner, I was ready for some sleep! Sabbath was a nice day, but warm. I woke up as the riders were preparing for their rides. I walked Tanna around, allowing him to graze and look around. I was pleased that his hamstrings were no longer tight and knotted. :) His back was still tender, but better than the evening before. After all the riders left, I headed back to the trailer and crawled in bed for another hour or two of sleep. Sabbath was leisurely, spent walking the horses and enjoying the warm weather while dreading the weather of Sunday. Rain and thunderstorms were on tap. Serts vetted in for his LD ok. He wasn't as well behaved as Tanna, but certainly not bad. He'll get used to it. :) He trotted out nicely. We've been practicing that alot. He has a slow start, so I have to ask him to trot while I'm still walking and then I start jogging. It's interesting as with Tanna I have to jump into a jog/run right away or he'll leave me behind! Serts trots nicely, but he takes a couple steps to get up to speed. The ride meeting for the Sunday LD revealed we would go out on the longer 15 mile blue loop first and do the shorter 10 mile pink loop last. I was very happy. I figured if I got Serts through the 15 mile loop and he happened to be a little tired, I could still baby him through a 10 mile loop. But I wouldn't want to baby him through a 15 mile loop. Pulse was 60 again with a single 40 minute hold time. All through the night, I listened for the rain. It finally came and I tacked up in the dark and wet. Lovely. But it was better for Serts. He still had a lot of winter hair and the 75+ degree sunny weather that Tanna had on Friday would have been more difficult for him. I put Serts' rump rug on him and covered the saddle with his rain sheet to keep the saddle dry for as long as possible and keep Serts from getting chilled. When I mounted up and headed for the start, Serts was interested in the activity, but not unduly concerned. Tanna was not happy that we were leaving him, but Serts didn't pay him much attention. At the start, I just walked out with the rest of the group. There were only 13 riders and I wanted to see how Serts would handle being with all the other horses. The front runners left us pretty quickly, but Patty De Mott tucked in behind us for awhile. She was riding a new, young horse and while this was Serts' first ride, he is not extremely young at 20 years old! We went along in companionable silence, occasionally making a comment here and there. 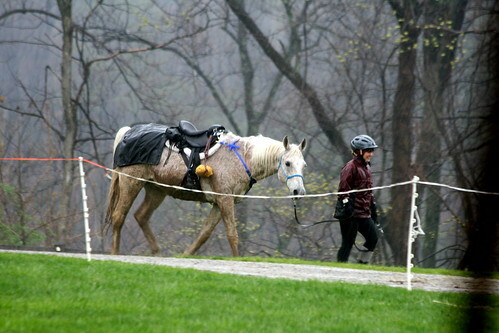 After a few miles, Patty decided we were going too slow and her horse was doing well, so she headed on down the trail. Another group of riders passed us. At this point, Serts became concerned. Surely something was wrong here! When you ride out on a trail ride, you all stay together! He wasn't too bad, but he was a bit upset. Headed down a hill, I decided to pull off trail and take a short...break. Another group of 3 riders were just behind us. I exchanged pleasantries with them and proceeded with my business after they got out of sight. Well, Serts just fell apart. That was so not right. To allow so many horses to get so far ahead of us. What was I thinking?? He spun around me in a wide arc as I attempted to position him to mount. I finally managed to lunge into the saddle and we headed down the hill after the other riders. We stayed a decent distance behind for awhile, but caught up to the last group of 3 riders as they were about to ascend the hill to the Pekin Saddle club. I insisted on a walk up the hill and the riders pulled away again. At some point Serts' HRM was reading very high. Almost 200 bpm. I though the girth had loosened, so I stopped to see if I could fix that. It took about 5 minutes for me to remount because Serts would not stand still. We went side-passing down the trail. He does a very nice side pass. Silly horse. We managed to stay behind the other riders until we were about a mile from camp. I hung back a minute, but it became clear they weren't moving right away, so I eased on past them. They fell into line behind me. Apparently the mare that had been leading decided she didn't want to lead right then, but was perfectly happy following Serts. Ok by us. Serts' HRM was still reading quite high. I had long since abandoned relying on it and was riding to speed (slow speed) and terrain rather than HR. At the pavement, I hopped off and walked in. By the time I got to my vet check stuff set out, Serts was at 53. Ok. Straight to the vet. 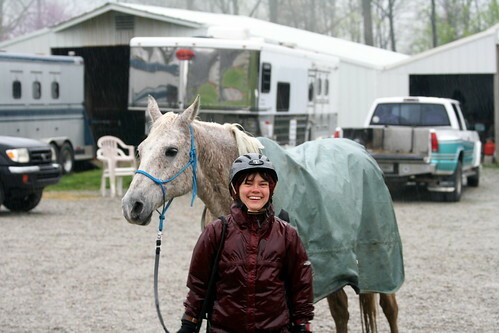 I had thought I would pull the saddle, but with the rain, it was just easier not to, especially since he was down. Serts vetted in well and trotted out nicely. 40 minutes and we'd be on trail again. Daniel graciously followed me back to our vet check area and offered to hold Serts for me. 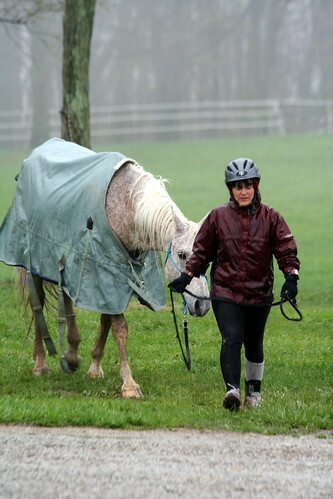 We tossed the rain sheet over him to keep the saddle a little drier and to keep Serts warm and dry. I opened up the hay and dumped some food in his dish and headed off to find a warm, dry sweatshirt as well as a porta potty. At the trailer, Tanna looked cold and pathetic, so I quickly switched out his rain jacket for his warm winter coat and gave him some dry hay. Then I found a dry sweat shirt for me and drank some protein drink. I grabbed a small bag of cheetos and headed back to the vet check area. Serts had eaten all his food and was grazing. I thanked Daniel and asked him to yell at me (from the dryness of the porch) when I had 5 minutes left in my hold. I continued to let Serts graze until the end of the hold. I removed the rain sheet, tightened up the girth and mounted up. The 3 riders that had come in with me were not out yet, so we headed out on our own. Serts was sedate and trotted along at a sane speed. He kept listening behind him for the other riders, but they never caught up with us. I urged him to keep moving, keeping him interested by throwing in a canter every now and again. The pink loop repeated much of the blue loop, so Serts had already seen the trail. The loop was uneventful. When I reached the pavement again, I hopped off to walk the last bit. Again, Serts' pulse was down below 60 by the time I got him to the vet check area. 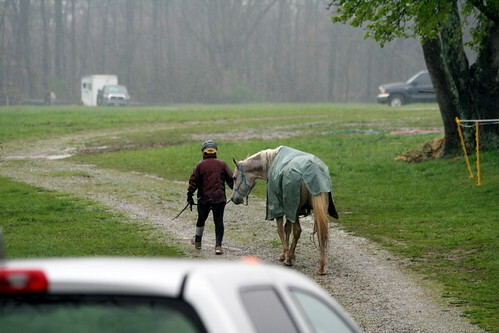 So I pulled his tack and threw his rain sheet over him. He vetted in in fine style, looking like he could go do it all again. But with the rain, I was thankful we didn't have to!! :-) After we finished with the vet, Amy told me our ride time was 4 hours 34 minutes (not bad for an old man) and we were tenth place! :-) So he top tenned his first LD out. :-) I was very happy to hear that! I headed back to the trailer, leaving all my stuff up by the house. I stopped at the water hose and sprayed the mud off Serts' legs and belly. That stuff is hard to remove after it dries!! Serts and Tanna could see each other at this point and kept calling to each other. 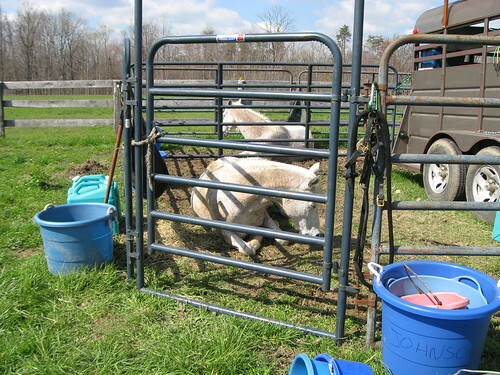 I turned Serts into the pen (it was configured so it could be larger for one horse or split into 2 smaller pens. I left them together in the larger pen. Tanna hadn't eaten all his breakfast, so Serts attacked it. Tanna of course decided he wanted some then, so the pair of them were eating out of Tanna's large flat pan. Happy to see them together and eating, I got our wheeled cart and headed back to get all my stuff. No point in getting clean and dry and then having to deal with dirty/wet saddle stuff! Daniel helped me load the stuff into the cart and came back to the trailer with me. 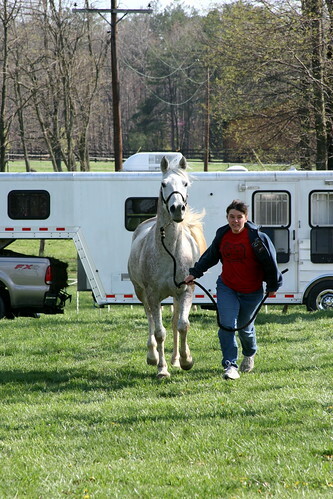 We packed up the trailer and camper except for the horse pen and then I cleaned up. We visited with Bill, Amy and Drs. Mike and Maureen for a good hour or more while allowing the horses to rest up. Finally, we headed back into the rain. 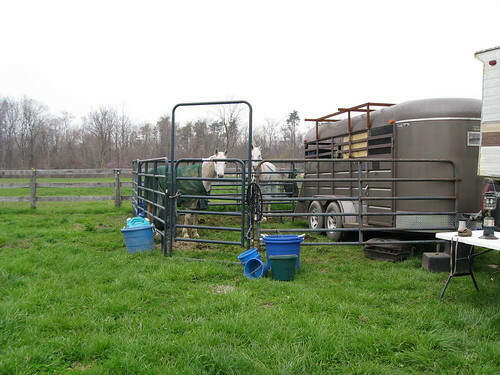 I walked the horses around, grazing and trotting them a little, while Daniel hung the corral panels on the side of the trailer and secured them. Then we loaded up the horses and headed for home. Tanna's back was no longer tender by Monday afternoon and Serts showed no issues from his LD. Another successful weekend. Although I now have some work to see if Tanna's saddle needs to be tweaked or my riding corrected or maybe it was just a combination of things that led to his soreness. Chicken Chase is always so much fun. Even in the rain! :-) I am proud of the horses and so happy to be riding Serts. Now I have an LD horse and an endurance horse! I know Sabine and Leon as well. I met her at Spook Run last fall. She won the LD and my friend and I got 2nd and 3rd behind her. Since then we've been emailing some. She mentioned riding her first 50 at Chicken Chase with you. She's trying to talk me into doing a slow 50 with her at Top of the Rock. My horse has done 3 LD's but I'm not sure if we will try a 50 yet or not. Got to see how it goes between now and then. I was at Chicken Chase as well, but only rode Saturday. Will you be at the Top of the Rock? So glad you guys did well and had a great time! Love your blog and hearing all about your adventures in endurance. 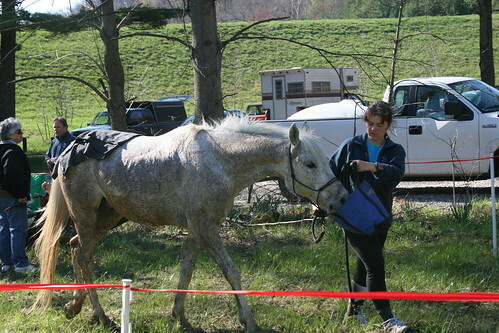 I hope one day to get started in LD/endurance riding with my young horse, Sam. His Dad was a good LD horse, so I'm hoping it runs in the family! Michelle just forwarded me the link to your blog - quite impressive! Looks very professional. I had a question for you: you mentioned some nice/concentrated electrolytes that you use and I forgot the brand name. Thanks for all you taught me on that day!!! Hope we can ride together some other time.